This Psalter is named after one of its owners, John Grandisson, who was bishop of Exeter from 1327 until his death in 1369. It was adapted for his use, having originally been made for someone who perhaps lived in the area of Chichester. In English medieval Psalters Psalm 109 usually starts on a new page, which often means that a space is left on the facing page. 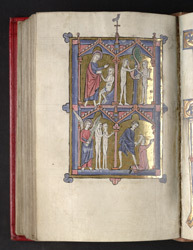 Here, the whole facing page was without text, and has been filled with a miniature containing four scenes: the Creation of Adam; the Fall; the Expulsion from Paradise; and Cain killing Abel.